President Donald Trump and First Lady Melania Trump attended the wedding ceremony of Treasury Secretary Steven Mnuchin on Saturday at the Andrew W. Mellon Auditorium in Washington, D.C.
Mnuchin, 54, married Scottish actress Louise Linton, 36. Trump wore a black tie tuxedo and the first lady donned a Gilles Mendel silk chiffon gown with Manolo Blahnik pumps. First daughter Ivanka Trump and her husband Jared Kushner also attended. A number of President Trump’s cabinet also attended, including Commerce Secretary Wilbur Ross, Housing and Urban Development Secretary Ben Carson, Education Secretary Betsy DeVos, and White House Press Secretary Sean Spicer. The Pences were also expected to attend. President Trump attended the festivities for several hours before returning to the White House. Mnuchin was born in New York City in 1962 to a Jewish family. His father was an equity trader at Goldman Sachs. His great-grandfather, Aaron Mnuchin, was a diamond dealer from Russia who later resided in Belgium and emigrated to the United States in 1916. Linton was born in Edinburgh, Scotland. She began training to become an actress as a young girl at The Edinburgh Drama Academy. Before moving to the United States to attend college, she served as a volunteer in Northern Zambia. In the United States she received a degree in journalism and shortly after started acting for TV and film. Linton starred in CSI:NY, Cold Case, and Cabin Fever, according to IMDB. 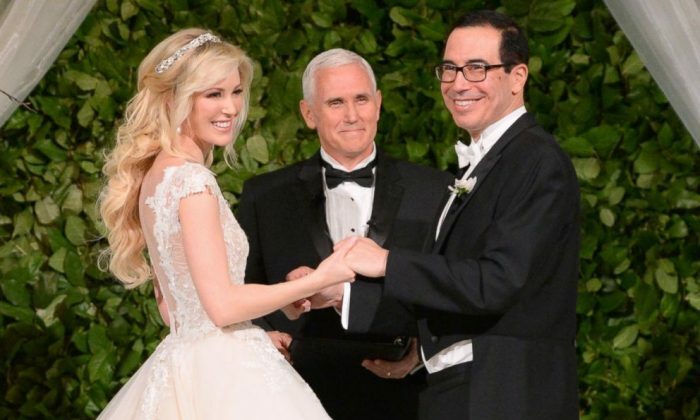 This is the second marriage for Linton and the third for Mnuchin.